I don't think we're in Wagga anymore, toe toe. In our last episode, we were in Canberra eating Ethiopian food. The purpose of that trip was to take Lisa’s visiting scholar to the Capital for some meetings. One of the things the guest requested, when Lisa asked her pre-trip what she might like to do, was to go to the coast. Wagga is about 4 to 4.5 hours from the coast, so that seemed a bit long, but since we were already going to be in Canberra for the weekend, it was an easy day trip on the Sunday. This picture of kangaroos is chronologically out of order; we came across them at the end of the day. But you need something better than Dan's toes to think about. Canberra (as well as Young, and many of the other areas we frequent) is on the tablelands – sort of mesas in what Australians refer to as mountains. The Snowys are nearby, and the drive from Wagga to Canberra goes through some beautiful hilly country. All of this, from the Victorian Alps in the south through to the Blue Mountains and into Queensland, is part of the Great Dividing Range that separates coastal Australia from inland Australia. But we didn’t really realize how high up we were until we started to go down to the ocean. It was a spectacular drive down (and back up later in the day), descending for probably 20 minutes of twisty turny roads through lush rainforest. People comment that it is a twisty and steep highway…well they’ve never driven up to Mount Edith Cavell! At least this road has a centre line and an overtaking lane occasionally. Our destination for the day was Bateman's Bay, which turned out to be scenic but boring. On the way out of Canberra, we stopped in the little town of Bungendore for a market. Not much there, but some interesting crafts and Dan added to his marmalade collection (gotta start eating some of it!). 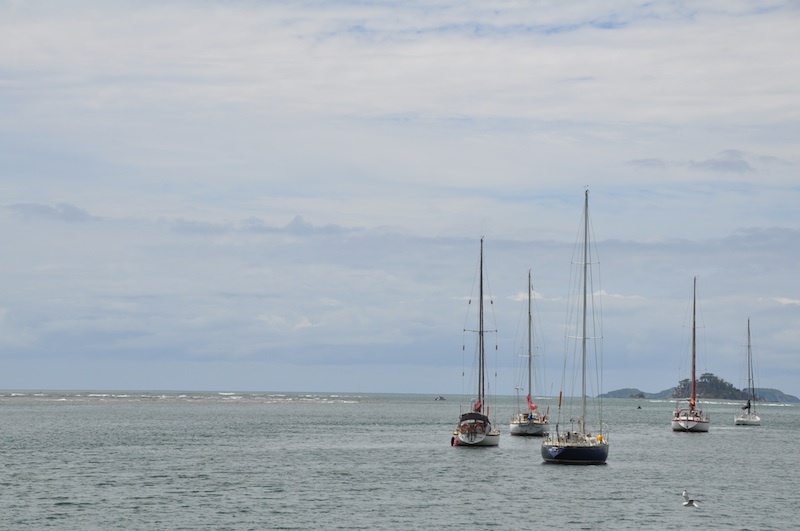 We then headed out to our destination of Batemans Bay, which actually turned out to be a bit of a disappointment – a touristy coastal town that is probably great if you are there to drink and sail. So, on the advice of the info booth, we headed south and a bit inland to Mogo. Mogo is a gold-mining town that pretty much died, and to regenerate itself became a crafty/touristy shopping haven. In 2003, it became the first town in inland Australia to get rid of plastic shopping bags (with the motto “no go in Mogo” — gotta love that!). A cool place, with good food, a great kitchen shop, a place selling alpaca goods, a leather shop, etc. This is where we finally ended up...a nice scenic beach. After Mogo, we headed back to the coast to South Rosedale Beach. It was great. Windy and a bit cool, but perfect for a stroll and to watch the waves roll in. 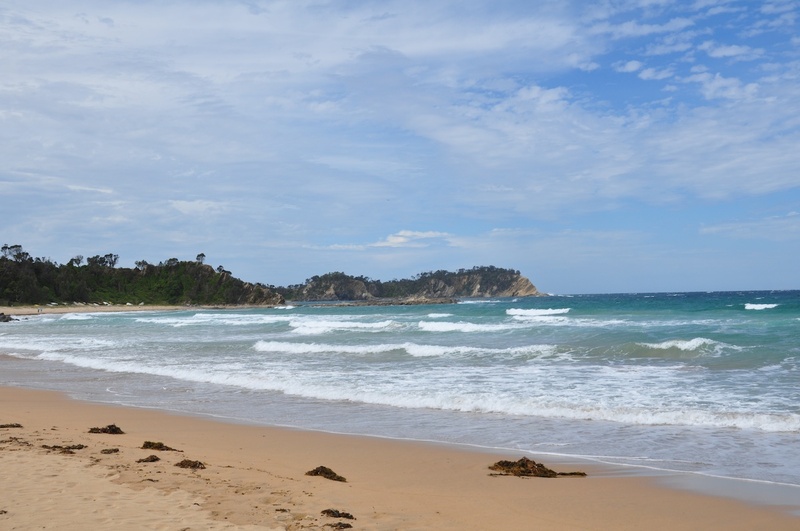 Lisa collected shells, Dan took photos, our visitor just marveled at the beauty that is Australia! 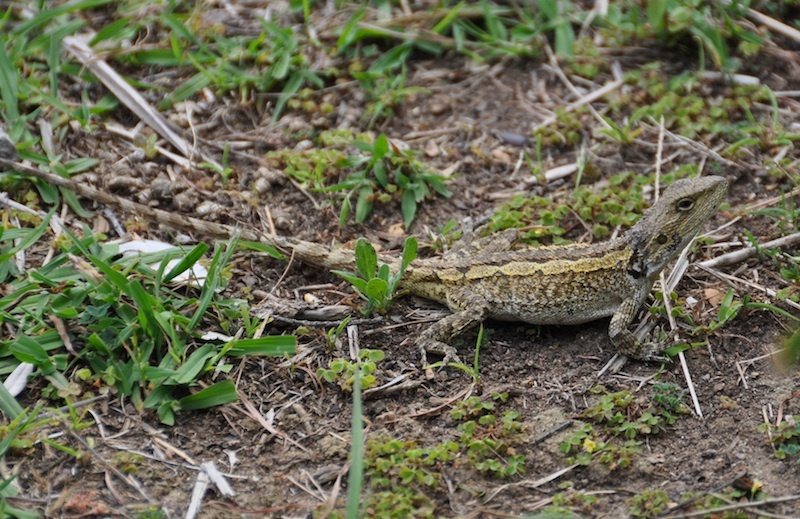 And we were all thrilled to see some sort of lizard – haven’t identified it for sure, but it was either a Jacky or a Nobbi dragon. This little (well not so little - 15 inches nose to tail) dragon startled Lisa on the path to the beach. We'd be grateful if someone can positively identify it for us. And then, back on the road to Canberra. 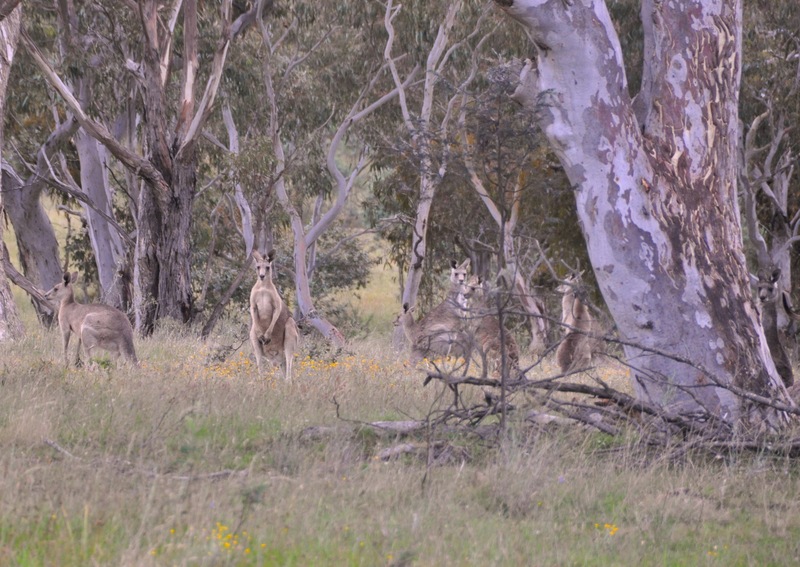 It was, fortunately, getting toward evening so between Lake George and Canberra we saw a huge mob of ‘roos out grazing. Hard to tell, but probably around 50, with a couple of them even boxing when we first passed by in the car. By the time we found a place to turn around (Dan almost got us killed in heavy traffic!) and got back to them, the fun and games had stopped (for the ‘roos, at least) but we still had a great viewing. So, another good day of experiencing Australia. 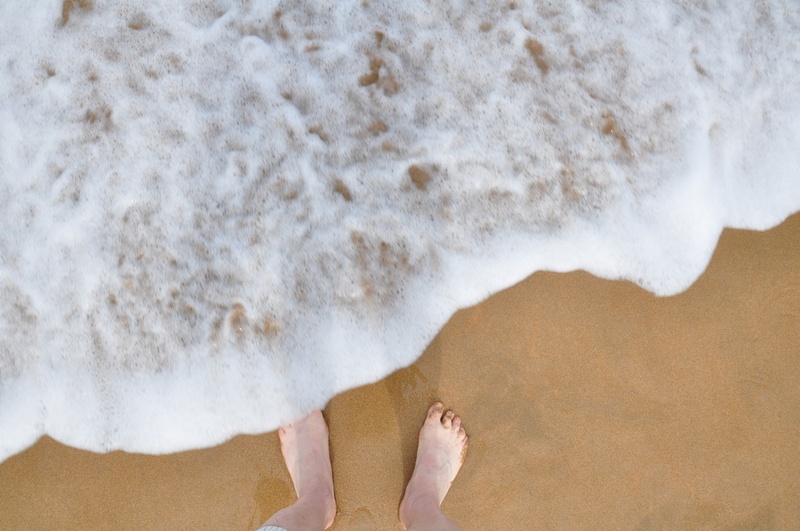 We aren’t really beach people, and though it was inevitable that we would get there at some point we didn’t think it would be this soon. But, thanks to a guest, we did it, and we had a great time! This entry was posted in Australia, beach, Canberra, driving, kangaroo, lizard, mountains, travel. Bookmark the permalink.